Not to Paris, it's like if not to visit this Paris city landmark. The Eiffel Tower does have a considerable appeal to tourists. This magnificent tower was built in the Champ de Mars Park on the banks of the River Seine. Although it has been built since 1889, this 300-meter tall tower still stands firmly. You can pay a ticket to go upstairs to the Eiffel Tower. In addition, this popular tourist spot in Paris also has a romantic dinner on the floor that the tower. Well, it looks like an inverted pyramid was inspired by the Paris Louvre Museum. This artistic museum with a history-filled artistic building has a glass pyramid that becomes its own mascot for the Louvre Museum. The contents of this museum also vary, ranging from sculpture to painting. In fact, in this museum you can see Leonardo da Vinci's phenomenal painting, the Mona Lisa. 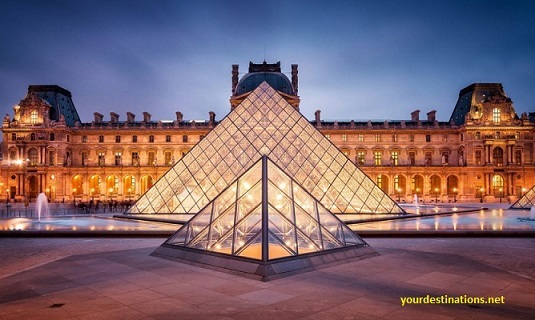 Until now the Louvre Museum still holds the title as the most visited art museum in the world. This curved warrior monument is located in the center of Place Charles de Gaulle, precisely at the end of the Champs-Élysées. Almost every tourist who visited Paris would not miss the opportunity to take pictures with the background monument built in the 18th century. The Arc de Triomphe was built to appreciate the services of those who fought for France in the Napoleonic Wars. In one district in Indonesia, namely Kediri, also made a replica of the Arc de Triomphe called Monument Simpang Lima Gumul. When you hear the name "Pont des Arts" maybe you will feel less familiar with the sights in Paris this one. However, when you have seen the picture, you must have seen it in the movies or photographs. Yes, this bridge is decorated by thousands to millions of padlocks of love from tourists from various countries who come here. Many couples come here and lock the colored padded locks with their initials to share their love. After that, the padlock key is thrown into the Seine River under the Pont des Arts Bridge to perpetuate the love of the couple. Not far from the Eiffel Tower, the Louvre Museum, and Pont des Arts, there is a 777-meter long river that looks very beautiful at night. The reflection of the lights from the buildings around the river seemed to make the night so very romantic. Invite the couple to take a leisurely stroll while chatting down the Seine River at night. In addition, you can also hire yachts to sail on the Seine River that looks very stunning. In fact, there are also cruises that offer sailing packages and romantic dinner on the boat while down the river. This one is the Roman Catholic Church that never deserves visitors. Many people from different parts of the world come here to worship or just travel to the church that was built in 1875 this. If you visit here, you not only see the splendor of the building of worship, but the Sacré Cœur is very close to Montmartre, where street artists show off their work. Which makes your trip to the Sacré Cœur more interesting, at Montmartre was also a lot of museums, art galleries, and cafes ala Paris. Le Marais is a historic district in the City of Paris. Historic buildings with very interesting architecture you can see when walking the streets of Le Marais. Walking down Le Marais will make you feel like you are in Paris in the middle ages, where the streets are still very ancient. Rows of cafes and small shops appear to decorate these Le Marais alleys. This one district still looks interesting though visited during summer or winter. Visit tourist attractions in Paris does not have to be expensive anyway. You can take your partner to Jardin du Luxembourg. This one garden has clean green grass and neat. The scenery is more beautiful thanks to the colorful flowers that look refreshing. Many local people or tourists come here to just relax while sitting in the fresh green grass. Visit Jardin du Luxembourg in the morning around 8 - 11 local time to get good sunshine and not too hot. Paris City Square is a tourist attraction that you must visit before you end the journey in this romantic city. Place De La Concorde is a spacious and very clean city square. There are monuments, fountains, and sculptures of high art that appear to adorn the square. The classical lampposts also appear to emit shining rays at night. Walking with a partner while holding his ladder down the Place De La Concorde is already a romantic activity, especially if done at night with the friendly weather. Well, that's a list of recommendation sights in Paris for you visit the yourdestinations.net. Which tourist attractions appeal to you most? Share Please!